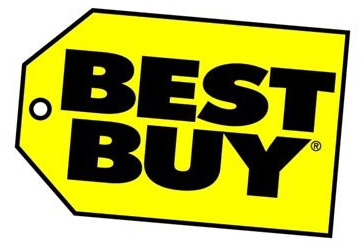 Save 20% On Select Products @ Best Buy!! It’s amazing how small appliances enhance our lives everyday. A recent visit to my local Best Buy got me noticing all the small appliances Santa forgot to bring me for Christmas. 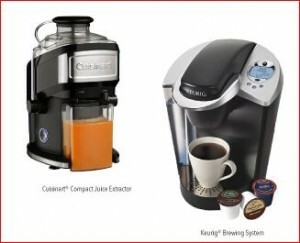 The first device that caught my eye was the Cuisinart Compact Juice Extractor. Juicing is the perfect way to stay healthy and shed those unwanted holiday pounds. It is so fun and easy to use even if you’re a beginner such as myself! It allows you to be creative by adding your favorite blends of fruits or vegetables. The juice pitcher holds up to 16 ounces while the pulp container holds up to 40 ounces and is removable for easy cleaning. It comes with a food pusher that fits securely into the feed tube which properly guides fruits and vegetables whiles juicing. The adjustable flow spout is manually controlled which prevents dripping. But best of all, the blade assembly and mesh filter basket allow for the maximum amount of juice extract and easily separates pulp. I’m the kind of person that is always on the go and I’m not always able to cook a delectable four course meal, so sometimes a quick healthy alternative is the best solution. The next skillfully crafted machine I noticed was the Keurig Platinum Brewing System. Now I know what you’re thinking, “health nuts don’t drink coffee!” But please understand- I need my coffee in the morning! Sometimes when I’m running late to work I think to myself, “if only there was a way to make a cup a coffee in less then 30 seconds”. Then one day while shopping at Best Buy I came across an appliance that would change my life forever. The Keurig Platinum Brewing System is a 1500-watt single-cup brewing system for gourmet coffee, tea, or cocoa. It uses patented K-cups so no more messy grinding or clean up is required. It has a 48-ounce removable water reservoir and a removable drip tray. Did I mention you even get to choose the cup size? What I love about Keurig machines is that they are versatile to fit your household. For instance, if you are a student living in a dorm or a studio the Keurig one cup mini brewer might fit your lifestyle best. If you live in a multi-person household where coffee and drinks are constantly being brewed the Keurig Platinum Brewer might be more useful! From juicers to coffee makers to toasters to pizza ovens, Best Buy has it all! You can save 20% on your choice of small kitchen appliances at Best Buy by printing THIS COUPON and bringing it into a local store near you! Let Best Buy help you get fit with technology. Take 20% off health & fitness products by printing THIS COUPON and taking it to your local Best Buy store! , this stuff is basically brand new terotirry for designers who work at architectural or larger scale. The question for me is can the rules of creation go beyond geometry and generative system to deal with issues of environment, site, and program.